We are offering HUGE SAVINGS right now. Yes we all know the economy is bad. We are seeing the down turn just like everyone else. Our holiday sales look not to be going to good as most retailers. So this is your chance! If you ever wanted a great item for your family game room don't pass this sale up. Right now as we speak we are selling many of our most popular items for just 5% over cost. Yes 5% over cost, savings you hundreds of dollars, even thousands of dollars if outfitting your entire game room. More Savings- Pay now with Paypal or pay by Check/Cash/Bankwire and Save another 2% more. We have pulled out all stops to save you money. Refurbished Pinball Machines, dramatic savings, treat yourself, you deserve it, and don't miss out. Unheard of Prices from $1299. Ready to ship in time for the holidays. Great Shipping Discounts too. Buy 2 and second one ships free! New Stern Pinballs save $500 Now! Digital Bubbler Jukebox, dramatic savings, Lets you load 600 of your favorite CD's onto the 250 Gigabyte hard drive with no loss of sound quality. There is an updated online database with over 1.6 million song titles that will make cataloging your music titles a snap. Slot Machines right from the Casino Floor to your front door. Fully refurbished. Quit throwing your money into someone elses machine. Save money and play at home. Many great titles ready to ship today! 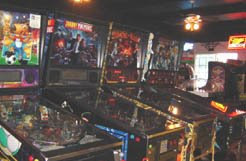 Great Pinball Machines Fully Refurbished and Ready to Ship in Time For the Holidays. HUGE SAVINGS on these below saving you up $1500 off normal retail pricing!